Thought leadership articles allow you to make arguments that favor your brand’s offerings, and do it with subtlety. But it’s getting easier to get away with bad or bogus thought leadership. The logic seems to go: As long as what we’re posting gets click-throughs to our website or blog, or keeps our name in front of people, does quality even count for much? Too often, an aggressive posting schedule excuses poor workmanship, or worse, thinly veiled self-promotion. Succeeding in today’s era of thought leadership has created a new demand on marketers. They don’t just have to be writers and editors. They now need to be collaborators (or, barring that, savvy interpreters) who can connect their would-be thought leader’s expertise to the company’s overall communications program: Marketers need to ask: how will this expertise or opinion help to position our firm, one of our services, our approach, or what we stand for? One of my marketing colleagues wrote about how her firm made a New Year’s resolution to produce more thought leadership. Since this new marketing operation ramped up, her company’s collective output on LinkedIn has been commendable! They’re making great progress. She reported that the process is getting smoother and there is more internal coordination. Her firm’s leaders are more frequently inspired to write, and their writing skills have improved as a result of this increased use. But it was clear that some of these posts had not gotten the attention they needed. Your thought leadership goal may be to post to your blog or to LinkedIn once a week. The work to reach that frequency may be done by one person, or distributed among many. These posts may pass through many qualified and knowledgeable reviewers inside the company. 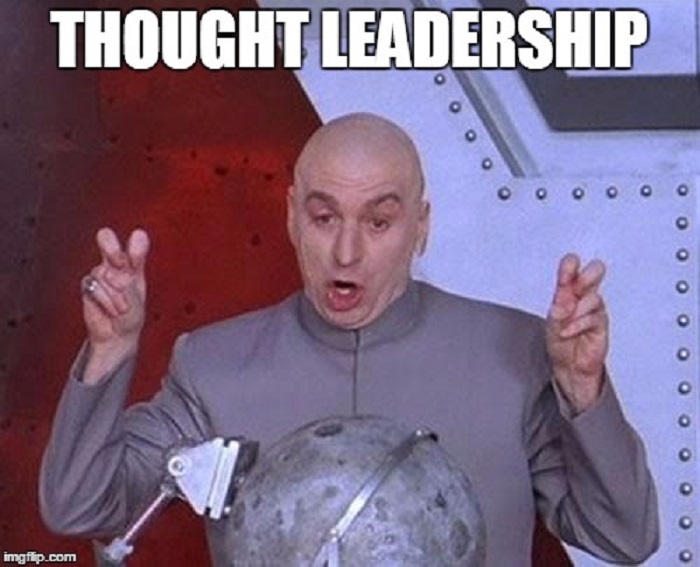 They all understand the new emphasis on thought leadership and the imperative to publish. But too often, it all happens in very little time. 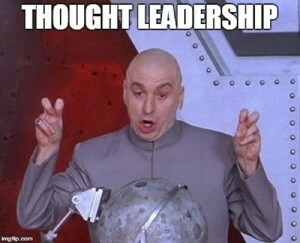 Too little time, in fact, to give your thought leadership the critical eye. Bad writing is not just a disease in itself. It masks bad or even bogus thought leadership. You probably won’t have time to fine-tune every sentence. Even if you only focus on those that are obviously too wordy or convoluted, you could greatly improve readability. Not only would you increase the clarity of the thought leadership – you would increase the quality of the thought! In fact, slowing the assembly line just a bit in order to clean up your output might reveal that some of your articles aren’t think pieces at all, but rather promotional content that could be better executed by a skilled copywriter. Use the active voice (it’s shorter than passive). Flag anything that you as a reader have to slow down to make sure you understand. Admittedly, this last one may be harder to do, but this can help your newer writers improve as experts — and as rainmakers for your firm. These actions will make writer, reviewer, and ultimately reader, clearer on your topic, your insight, your angle, and your value proposition. Your firm may have plenty of good talent for writing, editing, and reading for context, but if these people are more focused on getting the piece out the door (and time-crunched too), they’re less likely to stop the assembly line, or rework a particularly weak or muddy piece churned out to fill a hole in your posting schedule or meet a quantity goal. Your quality inspector could be a writer, but doesn’t have to be. It could be a knowledgeable professional, a person who is passionate about your industry, or someone with an ear for good storytelling and the market for your services. It should be someone who is impartial to your firm’s motivations, and can view each piece of content on its own merits independent of your marketing agenda.